Invite a charming long-eared family into your garden with this handmade bunny fivesome. This is one bunny family you'll be happy to welcome into your vegetable garden. 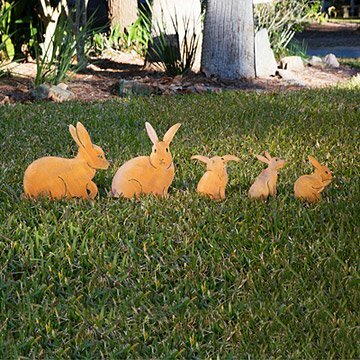 Handmade from steel by Chris Crooks, this five-some can be arranged to tell a charming story of mischievous baby bunnies following their parents--a sweet addition among your herbs and flowers. Handmade in Arizona. Patina will darken over time. Stakes add additions 3" H.
Love the startled looks from friends on my back deck when they see the bunny families in my garden taking a gander at the tomatoes and other vegetables. My garden and flower beds are happy places. These bunnies are fabulous. Rustic looking and not at all showy. Just beautiful in the garden. This group of bunnies hold up to the weather and add a touch of whimsy to by backyard. I would buy these again, they look great in my garden. I put them in my garden they look great. To secure these, I drilled holes in a board and then covered the board in marble chips, looks great. Birthday gift for someone who has EVERYTHING! Lovely Received it so quickly! These bunnies added just the right amount of whimsy to my garden. You can arrange them anyway you like and create a whole new scene.